Planks are uncomplicated, but not easy! Planks can be done anywhere, with no equipment or gear, you can chose the number, the duration, the variations and can even come up with some of your own. The only thing about planks is consistency and form! Planks are about never giving in and being stubborn! Planks are about I can do it, I will do it! and that’s the reason I love the basic plank. Something so simple looking can be so tough on the body! Think about it! A good plank is all about a good form. A straight line and no curves, a belly pulled tightly towards the spine, tight glutes, keeping the shoulders away from the head, feet should be hip width apart and lengthening and maintaining the long spine through the set. This is the only way to engage the core and work on that core! Why variations and what kinds and how do they help? Simply put, variations are fun! Just like we do sprints, tempo, long runs to add some variety to our running schedule, similarly a basic plank does get a bit boring and the challenge reduces. So what do we do: we add variety and try some more planks that further work on the core. Gives a whole body workout, more core engagement and when you don’t have time for weights or a run, then this is better than nothing! Is it really important to be able to hold a plan for really long? As a runner do I gain much from holding it that long? The discomfort of holding a plank for as long as the last bit of power in your body is building endurance!As a runner, I feel holding for too long is not very important! But holding the plank the right way for a decent time limit is great! It’s really about the form –your body posture while you are in a plank. That is how the core strength builds up. 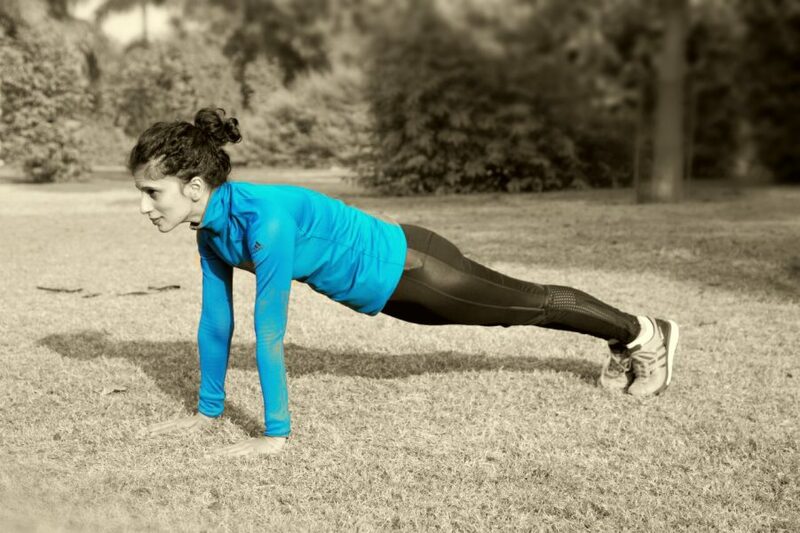 Once you have learnt to comfortably hold a plank for a minute or little more, you have to start trying the variations. Short duration planks in quick succession while keeping a good form is the real struggle and the real win for runners. Variations – Hold 30 seconds. Rest 30 seconds. Repeat 2 times on each side. As I get stronger, the repeat goes on to 3 on both sides and I bring in more variations. I am wearing my Adidas compression pants here! Perfect for all types of weather, a huge confidence booster since gives me a toned look and looks super athletic! Enjoy the burn kicking in, don’t get sloppy, feel good and Chin up, always!!! 5 Tibetan Rites : Rise and Recharge within 10 minutes!